You can download the RaceJoy app and Live Phone Track your route while running the Chuckanut 50k this year! RD Krissy did a test run at the Chuckanut Casual last weekend and it was super easy. Just follow the steps to search for the Chuckanut 50k to get yourself registered to be tracked on the route ahead of time. Then on Friday you can enter your bib number and let your friends know and they can follow you as well! There are links to share on Facebook, you can receive cheers along the way and the app has notifications (you can turn off) to cheer you along out there. Once you register to be tracked for the race on the app you will receive a detailed email with information on how to share your experience, track others and how to be tracked. This is an experiment shared with us by BuDu Racing. I hope those of you carrying a phone while running will try it out! Details included on our event poster and on the Facebook Event. Please register on the Facebook Event page so we can have props ready. Food Trucks and Beer Garden to Fuel your Recovery! Your race bib has a $5 voucher that can be used at the THREE food trucks or at the Beer Garden in Fairhaven Park. Ovn Pizza - new this year! There will be food trucks at Wander for the 7-10pm post party - your bib vouchers are only redeemable at Fairhaven Park. 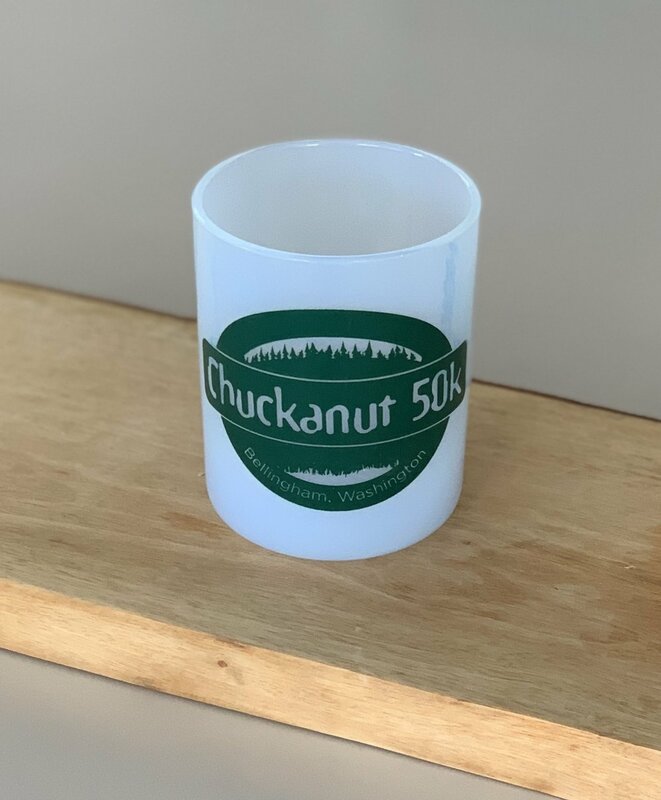 Chuckanut 50k logo'ed BibBoards (retail value $10) will be available for sale at PACKET PICK UP on Friday evening at PRIME Sports Institute. Those runners that ordered BibBoards at registration will find their BibBoards bundled with their race bib and shirt (if ordered a shirt) at check in. These are easy to use! But different than safety pins. Snap back piece onto stud from the inside of the shirt, fastening the shirt and bib in between the two pieces. Repeat in all four corners of the race bib. 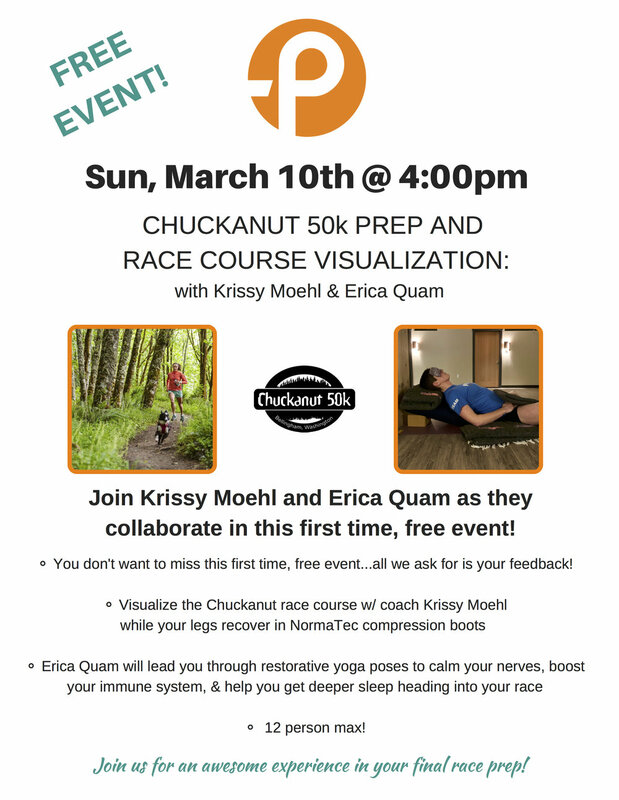 Whatcom Community College Massage Students will provide free massage to our Chuckanut 50k finishers at the finish line in Fairhaven Park. If runners would like to make a donation to Girls on the Run we will help facilitate the donation in conjunction with our raffle. You will get a raffle ticket for each $5 you donate! Theron Eirish, new WCC Massage Instructor, has provided massage to our Chuckanut 50k runners for 16 years! This year, after taking on this new teaching position, he is engaging his students to be at the finish line for us. Another awesome example of the Bellingham Community. Small Changes to the Course. Check out the New Map! Local Tad Davis helped our event a ton by creating this new map reflecting the few changes we needed to make to accommodate permit restrictions as well as integrating the Fairhaven Park trails to our finish. THE COURSE WILL FOLLOW THE KNOWN ROUTE THROUGH FAIRHAVEN PARK, TURNING RIGHT ON TO THE INTERURBAN. CONTINUE 10K SOUTH TO LOST LAKE PARKING LOT WHERE YOU WILL FIND AID STATION #1. YOU WILL LOOP AROUND THE RESERVOIR AND BACK ON TO THE INTERURBAN TO CLIMB FRAGRANCE LAKE TRAIL. RUN CLOCKWISE AROUND THE LAKE. RIGHT TURN ON TWO DOLLAR TRAIL. AID STATION #2 WILL BE WHERE 2 DOLLAR TRAIL MEETS CLEATOR ROAD. RUNNERS CLIMB CLEATOR ROAD AND MEET AID #3 AT THE RIDGE TRAIL. FOLLOW THE RIDGE, TO SOUTH LOST LAKE TO THE BOTTOM OF CHINSCRAPER WHERE A MINIMALLY STOCKED AID #4 WILL BE. RUNNERS CLIMB BACK TO THE TOP OF THE RIDGE STRAIGHT UP AND OVER (NO TURNS) AND INTO THE CYPRESS PARKING LOT LOOKING OVER THE SOUND. DESCEND CLEATOR ROAD ABOUT 1 MILE TO MAKE THE HAIRPIN LEFT TURN ON TO THE UPPER PORTION OF FRAGRANCE LAKE ROAD. WHERE THE UPPER SECTION OPENS TO THE ACTUAL ROAD IS WHERE THE COURSE DIVERGES FROM LAST YEAR’S ROUTE. from above - RUNNERS WILL MAKE A 90 DEGREE RIGHT TURN THROUGH THE WOOD GATES TO REJOIN AND DESCEND THE FRAGRANCE LAKE TRAIL. AID #5 WILL BE WHERE FRAGRANCE LAKE TRAIL MEETS THE INTERURBAN. RUNNERS HEAD NORTH BACK TOWARDS FAIRHAVEN PARK.